Continuing my explorations of Ken Forkish's Flour Water Salt Yeast, yesterday I baked his "Pain de Campagne" again, but with a difference. Forkish's formula for Pain de Campagne is, basically, a white bread. It has about 10% whole wheat. However, in his introduction to this bread, Forkish encourages the reader to experiment with increased whole wheat and rye and says that his own favorite version of this bread has 70% white flour, 20% whole wheat and 10% rye. Well, that sounded pretty good to me, so I did it. For the 800% g of flour in the final dough, I used 100g KAF Medium Rye, 200g Organic Sprouted Whole Wheat flour and 500g of KAF AP flour. This dough was quite sticky, and I was concerned whether I could develop enough dough strength. But the boules shaped up pretty nicely. They didn't expand much during proofing but had satisfactory oven spring. I had some of this bread for dinner last night when it was almost completely cooled. It tasted okay, but with a lot of grassiness. The sourdough tang was quite mild. Today, the flavors had melded, and the bread was really delicious, both toasted for breakfast and un-toasted for lunch. The flavor was similar to the "Field Blend #2," not surprisingly. I will happily make this bread again when I want a Pain de Campagne. I will try to remember to make it a day before I want to eat it though. It really improved a lot with an overnight rest. Looks like this would make a great grilled bread with some good olive oil, roasted peppers and some fresh moz! So did you adjust your bake to calm down the overactive starter per your last post, or adjust your ingredient temperature to compensate and try and follow his schedule? I think your suggestions are spot on! Also good with garlic, juicy chopped tomatoes, fresh basel and EVOO. Oh, if we could only get fresh funghi porcini over here without taking out a second mortgage! The only compensations I did were to use cool water in the final dough and shape the loaves after about 4 hours of bulk fermentation. I wasn't too far off Forkish's times, but then it has been cooling down a bit here. Excellent bake. Your posts are tempting me to get a copy of Flour Water Salt Yeast. I haven't had a chance to look at Forkish's book yet so I'm not at all familiar with his methods. Anyway, my question is: Did you retard these loaves? The reason I'm asking is that I recently tried Chad Robertson's method (from his Masters Class video) of high-hydration dough, where he turns the dough every half hour during bulk fermentation for 3-4 hours. Robertson's 3-4 hours of bulk fermentation sounds similar to Forkish's 4 hour method. The reason I bring it up is using Robertson's method, when I retard my loaves overnight, after a long bulk fermentation period where the dough is turned every half hour, shaped and placed in bannetons, the final dough continues to rise during retardation and the loaves over-proof in the fridge. This results in deflation when the loaves are taken out of the fridge and scored. They spring back somewhat, during the initial oven spring (at 500 deg. F Note: I'm using a Dutch oven), but the result is a slightly tighter crumb than if I had simply done three stretch and folds and allowed a shorter bulk fermentation. I'm thinking the cause may be the turning of the dough, coupled with long bulk fermentation that creates so much yeast activity that it needs to be baked when it passes the finger-poke test after shaping---without being retarded. Any thoughts on what's happening to me? Chad Robertson is identified as one of Forkish's mentors, and their methods are similar. All of Forkish's sourdough breads are retarded, I think. Some are retarded before shaping and some after. This Pain de Campagne used cold retardation of the formed loaves. If you read my other posts on Forkish's breads, you will discover that I've found all his time estimates way too long. But the resulting breads are really, really good, so I have just taken to watching the dough during bulk fermentation and during proofing and using my own judgement rather than Forkish's specified times to determine when to take the dough to the next step. I have tried a few compensatory tactics like using cool water rather than the warm water Forkish prescribes and using less starter, but I still end up with faster fermentation than he describes. I suspect it is mostly because my kitchen has been running about 78 dF. It's starting to cool off now, so we'll see what happens in October. Anyway, my advice is to just watch the dough and don't let it over-ferment. If you are dealing with a hot kitchen, you might try using cooler water to mix the final dough and using less starter as well. I wish I could quantify those suggestions, but I can't (yet). I really appreciate you taking the time to answer my question. After you explained about the water temperature and prescribed time(s), I'm certain you're correct. Didn't know Robertson was Forkish's mentor. Since certain aspects of their techniques are similar it sounds very reasonable. Hey David. Way to keep up the fight. Looks delicous and sounds like a good pain au levain. So here is my question. All of the loaves you've made from FWSY have very similar looks. Are the formulas similar? Are the loaves similar? Does he take different approaches to achieve new flavor profiles??? You noticed the similarity of Forkish's breads. eh? 2. The amount of levain used. 4. Dough hydration varies from 75 to 82%, determined by the flour mix. So, really, there are in my mind two decisions (flour mix and fermentation schedule). Those call two additional variables (amount of levain and dough hydration). Now, Forkish does encourage playing with these variables for differing flavor profiles, etc., which is what I did for this bake. But, as with Chad Robertson, he has a style of bread he prefers, and the variations on it are relatively minor. Except for baguettes, focaccia, and pizza, all his shaping is the same, determined by the choice to bake in a cloche or dutch oven. And he avoids getting into scoring by having you bake seam side up and letting the loaves burst naturally. If you you have oval dutch ovens or happen to have access to a commercial steam injected oven, you can shape as you please and get the same effect. In most respects, I really like the Robertson/Forkish approach. The breads are beautiful, in a rustic way, and they are indisputably some of the best eating breads I have baked. But, as you observed, they are all very similar. Since I also like other styles of bread, I'm not giving up on Jewish or German-style ryes, my notion of San Francisco-style sourdough, my SJSD baguettes, and so forth. great thing the rustic looks are amazing! Love the bold bake and crumb of this bread too. Oddly, The 70 - 20 -10 are the percents I use for AP, WW and rye in your SD bread formulas that are by far my personal SFSD style favorites, It is very tough to beat your SJ, SFSD and PC and I am guessing this bread doesn't flavor wise either. I use a rye sour for your breads, trying to get a more sour bread and put the as much of the whole grains in 15-20% levian weight too. 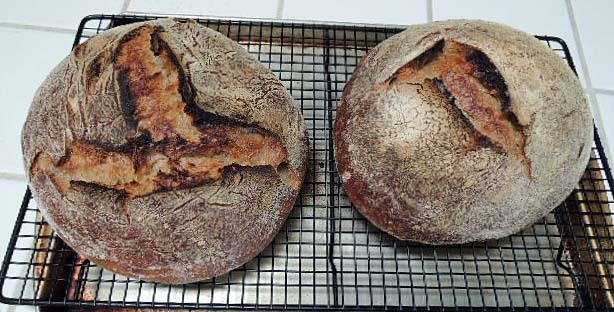 Sourdough in my book should be sour like SFSD used to be long ago as opposed to these less sour varieties popular today. Still, it is some pretty fine bread, but not as tasty as yours using the same flours. 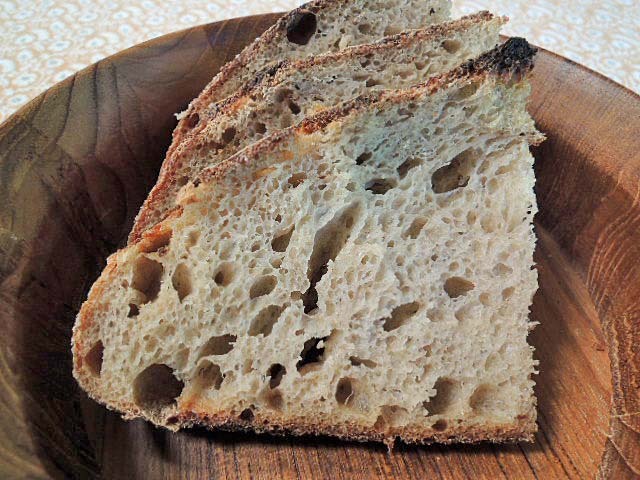 As you are aware, taste varies in regard to the degree of sourdough tang, and, for that matter, the proportion of whole grain flours in the breads. Personally, my taste is eclectic. Largely through Hamelman's Pain au Levain, I discovered just how good a white bread can be without being sour. I really enjoy it, but I would get tired of it quickly without having a variety of other breads. Along with the breads in this blog entry, the same day, I also baked a couple loaves of my SF-style SD with 30% whole wheat. Next weekend, I'll be in Portland and hope to check out Ken's Artisan Bakery as well as Kenny & Zuke's for their pastrami and rye bread and pickles. Those unscored, craggy crusts are eye candy. And the flavor has to be superb, too. I very much like a blend of flours such ash you have used here. It's very much in the same range that I use for a pain de campagne. One gets that whole-grain flavor without the heaviness sometimes attendant in 100% wholegrain breads (this from a man who enjoyed a sandwich made with pumpernickel for his lunch). Today - 2 days after it was baked - the flavor of this bed is better than yesterday. Did the sprouted WW flour contribute to enzymatic activity (faster fermentation times) or the grassy notes? I have not baked with it yet. Glad to hear of a good source of dill pickles in P'd. I've made note for my next visit. I just got the book from the library and hope to try something next weekend. Jealous of you retired folks and more flexible baking schedules! That flour supposedly speeds up fermentation. I have also read that it absorbs more water. I have used it twice to date. I think it absorbed less water than regular WW flour. I'm just not sure about the rate of fermentation which has been fast regardless of the flours I have used. The first bake with sprouted wheat flour, I thought it had a sweeter flavor. This time, I'm not sure. It may have been that this bread just needed time to equilibrate. Bottom line is I am still getting a feel for this product. I'm really not ready to generalize. Hi David loved the bread and loved the great posts generated from the group, all of great interest. I have to laugh the other day when i held my class for family and friends i actually corrected a loaf that had been placed onto the baking tray seam side up, i thought after i should have left it to show the difference and the effect, but i suppose the trade training took over and flipped it the right way up. i am now looking forward to doing a couple seam side up for the visual effect and comparison. Many thanks and kind regards Derek. Thanks for your kind words, Derek. I do love the unpredictable, rustic blooms of the breads baked seam-side up. But, the truth is, I'm enough of a control freak that leaving a loaf un-scored, thus relinquishing control over the bloom pattern, was hard to accept at first. Each approach has its virtues. Actually, the biggest problem I've had with letting loaves bloom at will, derives from my habit of meticulously sealing the seams during shaping. I had to force myself to get a bit sloppy. I have very much enjoyed the discussion generated by my posts. It helps clarify one's thinking. That is the allure of the Chacon. Beautiful , bold loaves David! Boy those loaves exploded open with beautiful ears! Once again nice baking. You have also provided a very clear overview of Forkish's techniques and agree that his formulas have provided some of the tastiest bread I have ever baked.